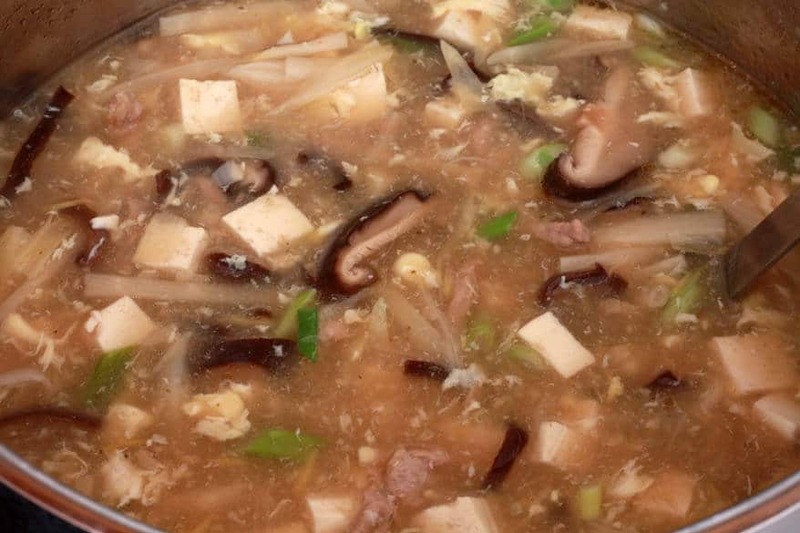 Good restaurant Chinese hot and sour soup has a very distinct flavor that can be challenging to replicate. And not all restaurant hot and sour soups are created equal. Not by a long shot. Though you may not be able to pinpoint the difference, you can tell when shortcuts have been taken. And have you noticed that you can generally predict the quality of the entree based on the quality of the hot and sour soup? A really good hot and sour soup is a good omen for the food to follow. Here is an authentic Chinese Hot and Sour Soup recipe that I carefully crafted, paying very close attention to detail. This is the real deal. It is as good as the best hot and sour soup you have enjoyed at your favorite Chinese restaurant. I’m confident you’ll agree. I’ve included detailed step-by-step pictures to familiarize you with some of the lesser known ingredients and to ensure your success in making it. This is an easy soup to make, it just involves some prep work. Get the prep work out of the way – much of which can be done well in advance – and then all you have to do is combine the ingredients. 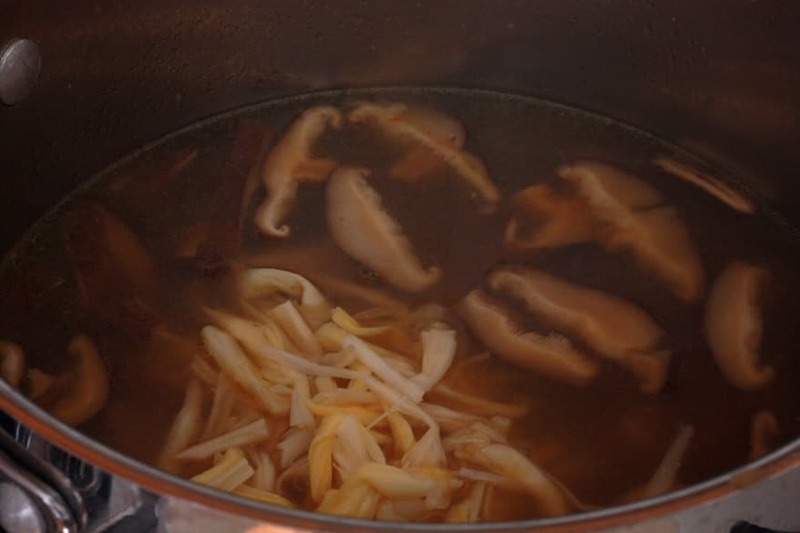 Once you’ve made it and are familiar with the ingredients and the steps involved, making it the next time will be a breeze and you’ll become famous among your friends and family for the best Chinese Hot and Sour Soup in town! Before we get started, let me introduce you to a couple of key ingredients in this soup that you may not be familiar with. 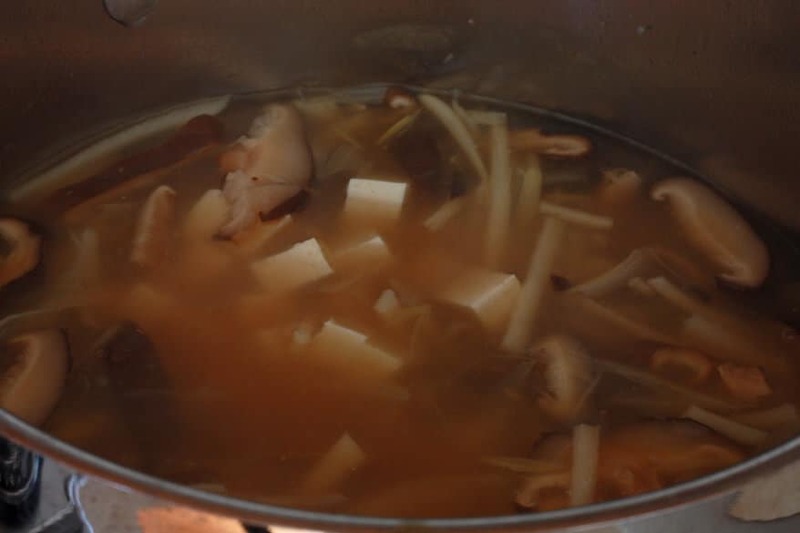 This soup uses two types of dried mushrooms, Shiitake and Wood Ear. 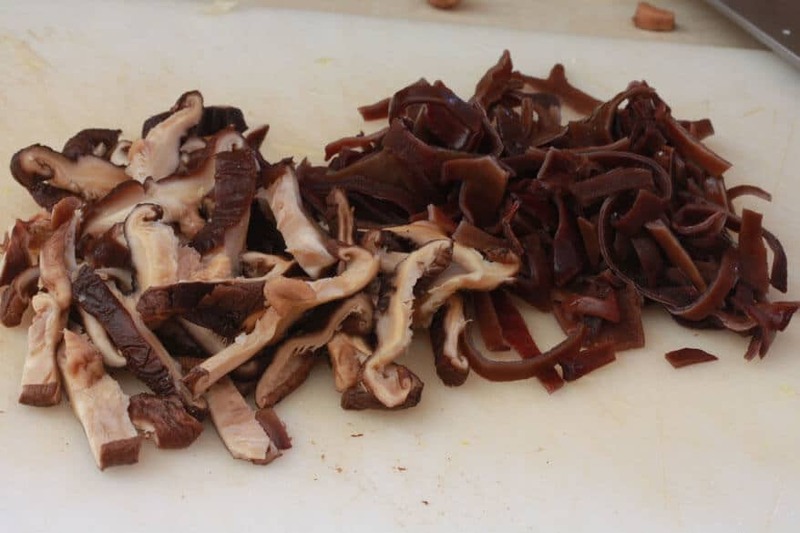 While most of you have heard of shiitake mushrooms, wood ear mushrooms, also called cloud ears or black fungus, are less commonly known. 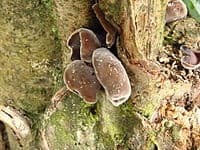 Wood ear mushrooms grow on trees and…look like ears! They’re usually sold in dried form and often already sliced. There are a number of culinary uses for day lilies. Fresh day lilies are great in salads, stuffed, battered and fried, or sauteed. They are also very nutritious, packing a variety of vitamins. Day lilies also play an important role in Chinese traditional medicine where they are used to help detoxification, urinary problems, jaundice, insomnia, coughs and…ahem…hemorrhoids. 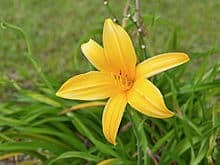 Day lilies have been used as both food and medicine in China for over 2000 years. 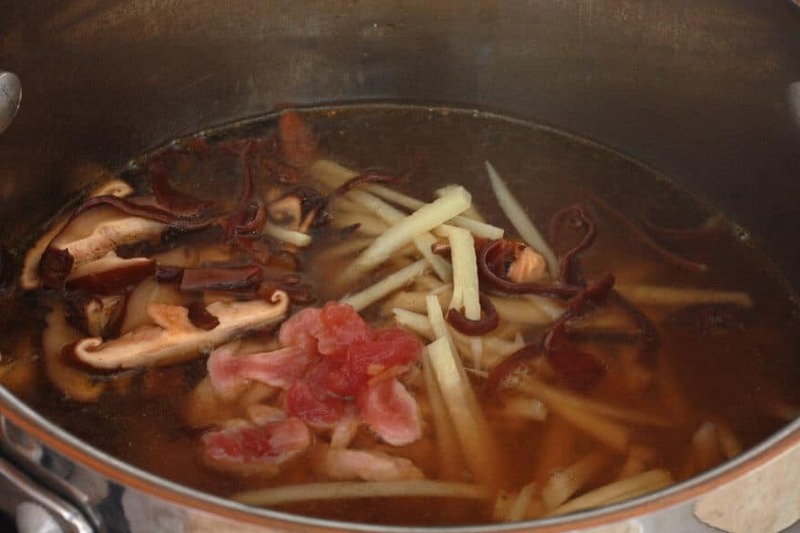 A key ingredient in Chinese Hot and Sour Soup, dried day lilies can be purchased in Asian grocery stores, usually in the refrigerated section. Now that you’re familiar with these two lesser known ingredients, let’s get started on the soup! Place the mushrooms in a bowl. Pour boiling water over them and soak for 20 minutes. Reserve 1 cup of the mushroom liquid. Give the day lilies a brief rinse. Place the day lilies in a bowl and pour hot water over them. Soak for 20 minutes. 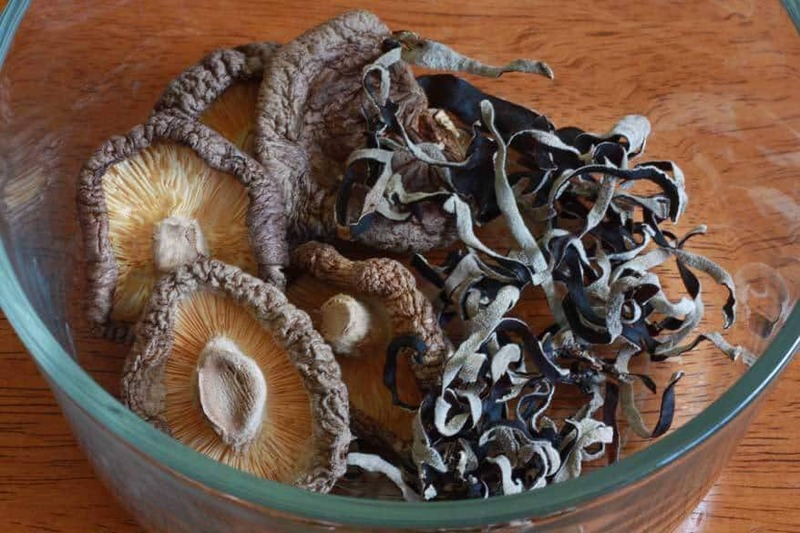 While the mushrooms and day lilies are soaking, prepare the remaining ingredients. 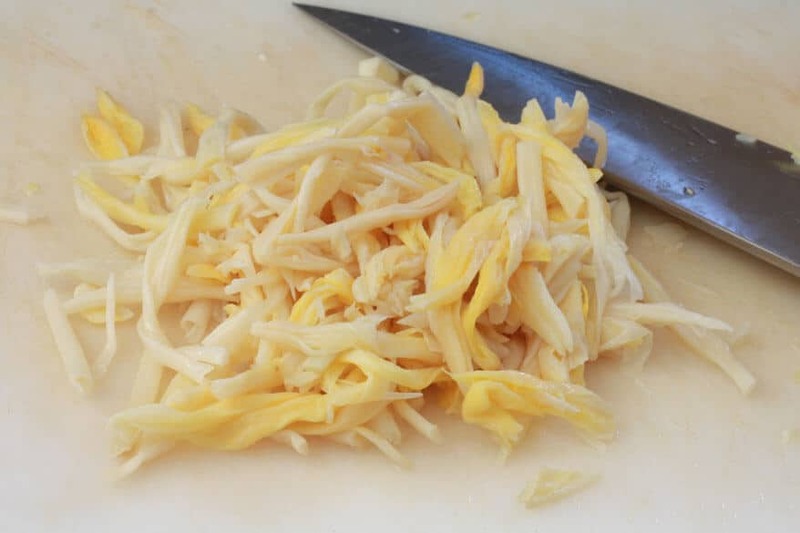 Mince 1 teaspoon of fresh ginger. 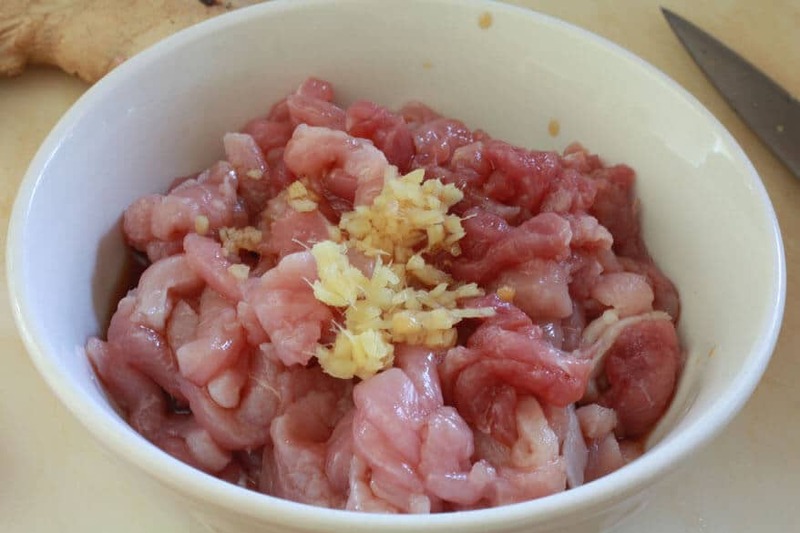 Place the pork in a small bowl and combine with the ginger and 1 teaspoon of soy sauce. Set aside while preparing the remaining ingredients. 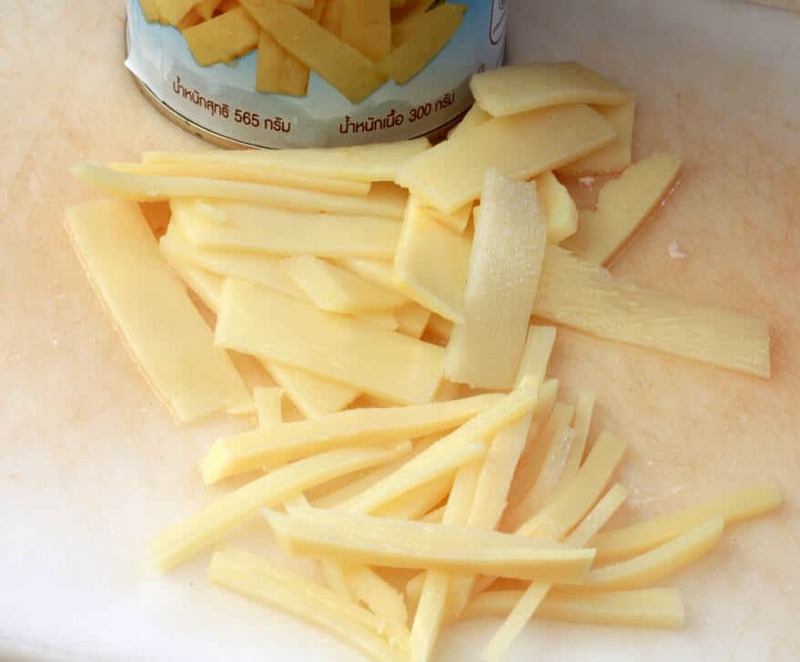 Drain and julienne the bamboo shoots. 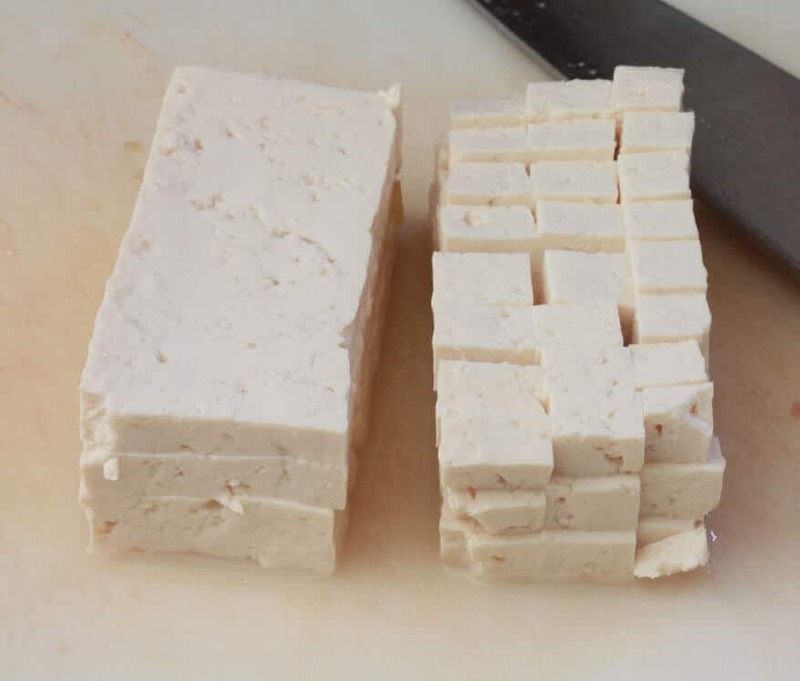 Cut the tofu into 1/4 inch cubes. Drain the day lilies and squeeze out any excess liquid. Cut the hard ends off the lilies. Slice the lilies lengthwise. Chop the lilies into 1 inch lengths. Squeeze the water from the mushrooms. Slice the shiitakes and chop the wood ear mushrooms. All the ingredients are now ready! Bring the chicken stock and reserved mushroom liquid to a boil and add the soy sauce, vinegar, chile oil, sugar, hot sauce (adding more according to desired level of heat), and pepper. Add the pork, stirring to prevent the pork from sticking together, the bamboo shoots, and mushrooms. Simmer for 2 minutes. Add the day lilies and the cornstarch mixture. Return to a boil and simmer for another minute until slightly thickened. Add the tofu and simmer for another minute. 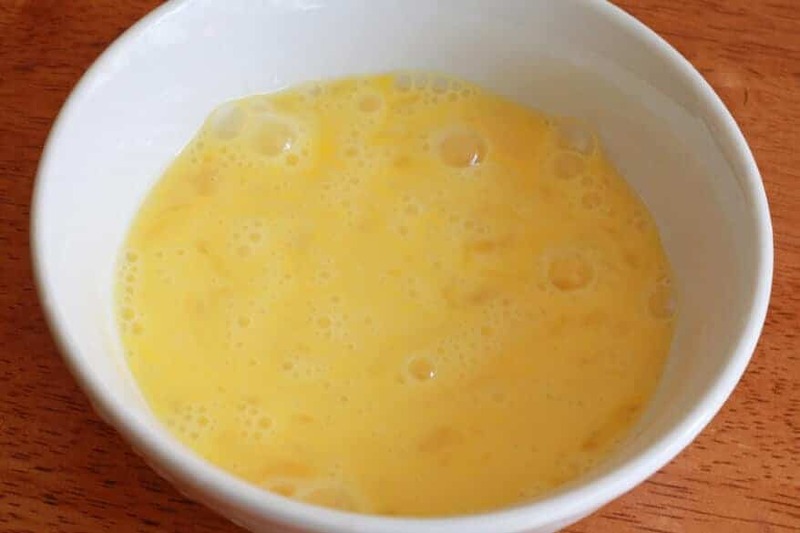 Lightly whisk the eggs in a bowl. Pour the egg mixture in a steady stream into the simmering soup, remove from heat, and let sit for 20 seconds to let set in fine strands. Stir gently. Add the sesame oil and green onions. You’re ready to eat! 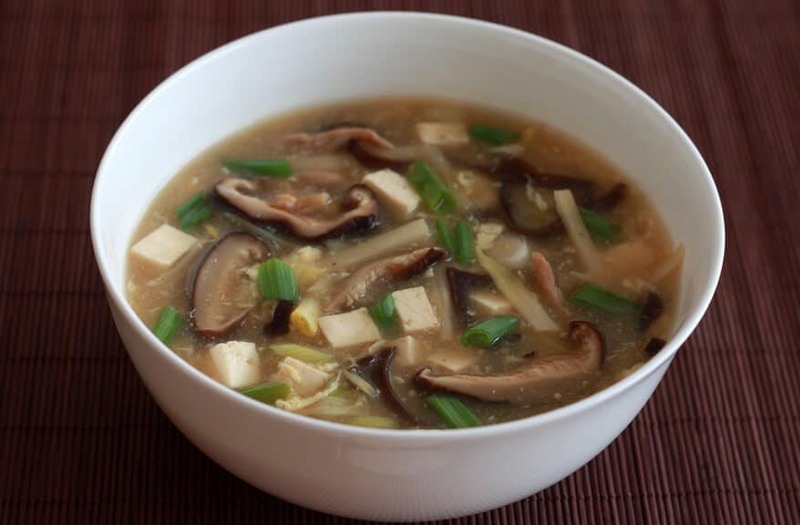 A delicious bowl of authentic, restaurant-style Chinese hot and sour soup! 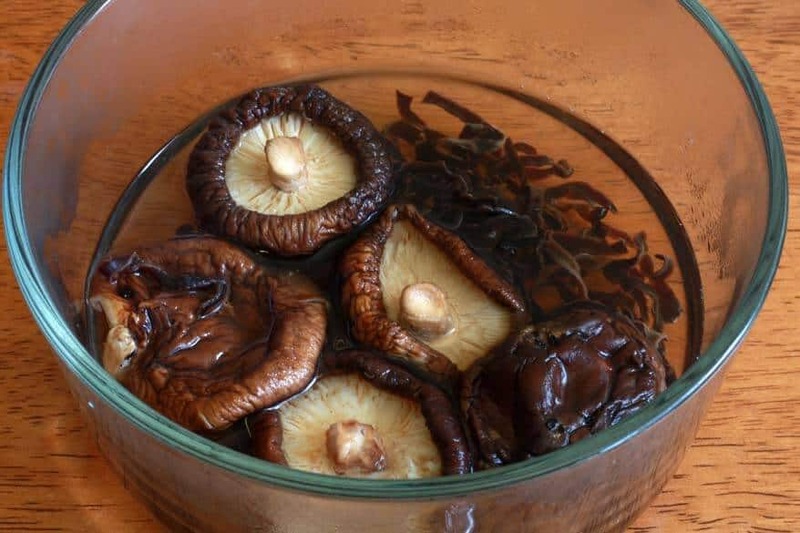 Place the shiitake and wood ear mushrooms in a glass bowl and pour boiling water over them. Soak for 20 minutes. Reserve 1 cup of the mushroom liquid, discard the rest. Squeeze the liquid from the mushrooms. Slice the shiitakes and chop the wood ear mushrooms. 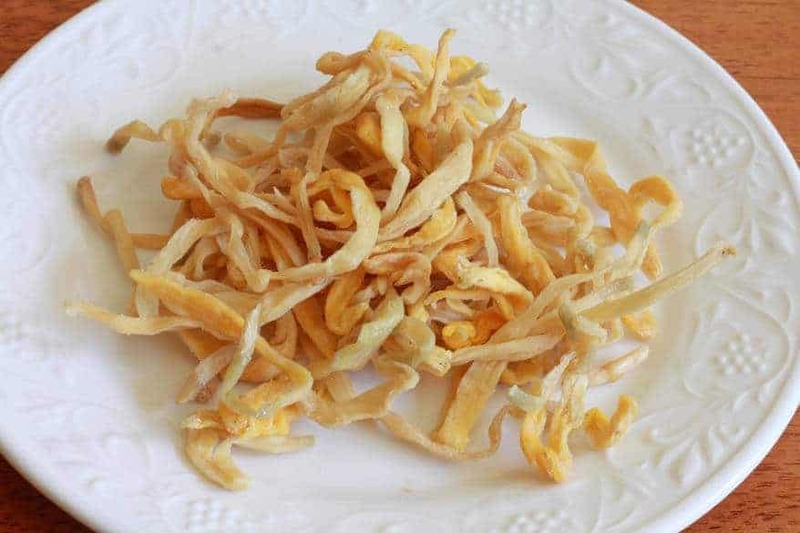 While the mushrooms are soaking, quickly rinse the dried day lilies and soak them in hot water for 20 minutes. Discard the liquid, squeezing any excess from the lilies, cut the hard tips off the bottoms, slice the lilies lengthwise and chop into 1 inch lengths. While the mushrooms and day lilies are soaking, place the pork in a small bowl and combine it with the ginger and teaspoon soy sauce. Set aside while you're preparing the other ingredients. Bring the chicken broth and the reserved cup of mushroom liquid to a boil in a stock pot. Add the soy sauce, vinegar, sugar, chile oil, hot sauce (adding more according to desired level of heat), and pepper. Add the pork, stirring to prevent the pork from sticking together, the bamboo shoots, and mushrooms. Simmer for 2 minutes. Add the day lilies and the cornstarch mixture. Return to a boil and simmer for another minute until slightly thickened. Add the tofu and simmer for another minute. If you don't have black vinegar, the closest substitute is balsamic vinegar. Disclosure: I was not compensated by FungusAmongUs for this post. I received some mushrooms to sample and all opinions and entirely my own. I would love to win these mushrooms because I love a really good hot & sour soup. And this recipe sounds wonderful. Thank you for posting it. I love shiitake mushrooms. Who am I kidding? I love ALL mushrooms, at least all the ones I have tried. Have never had the chance to try wood ear mushrooms and would love the opportunity. Thank you! Funny Story..The name of the Mushrooms are the nickname we gave a kid in High School. I’ve enjoyed Chinese food for something like 60 years, have learned to prepare a few dishes and have particularly enjoyed Sweet & Sour Soup. Send me these mushrooms and I will learn to make it. And I expect I’ll make it even without winning the mushrooms. I would love to make this soup! 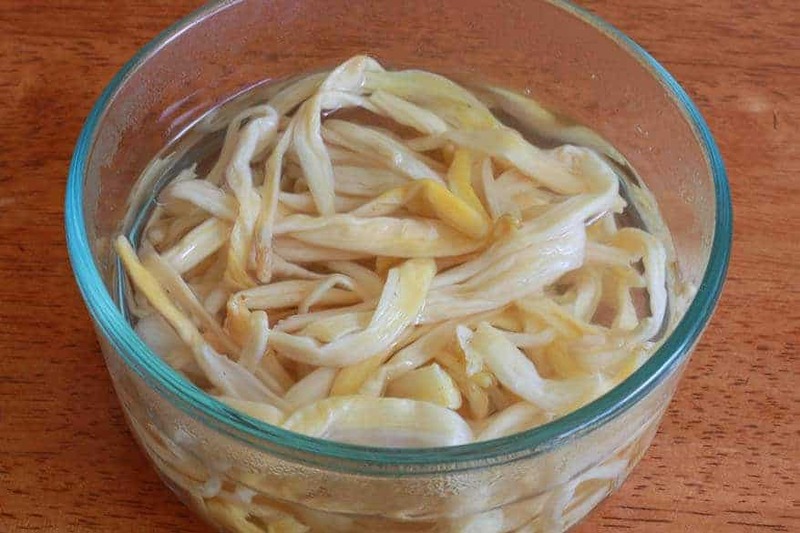 I love hot and sour; I’ve always used shiitakes, but never the wood ear mushrooms. 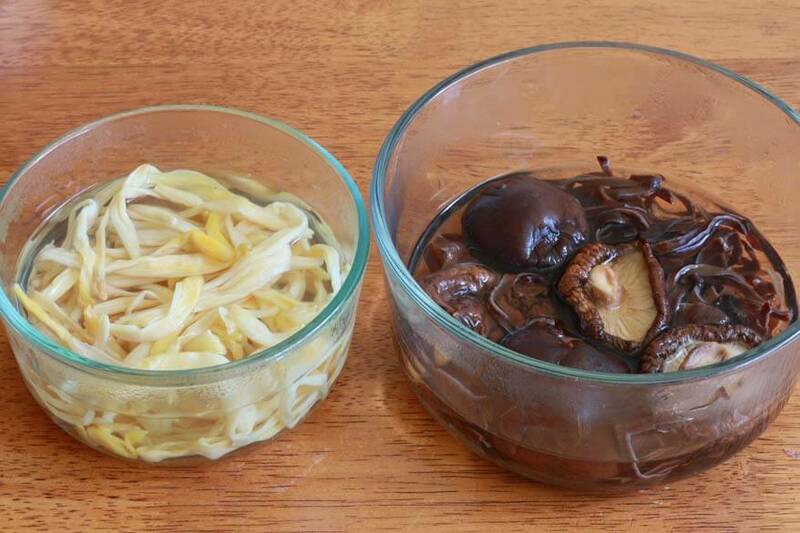 I’ve heard of using a black fungus, but can never find it. It looks as though these are similar, if not the same thing…? Hi Quenna! Yes, they’re one and the same! 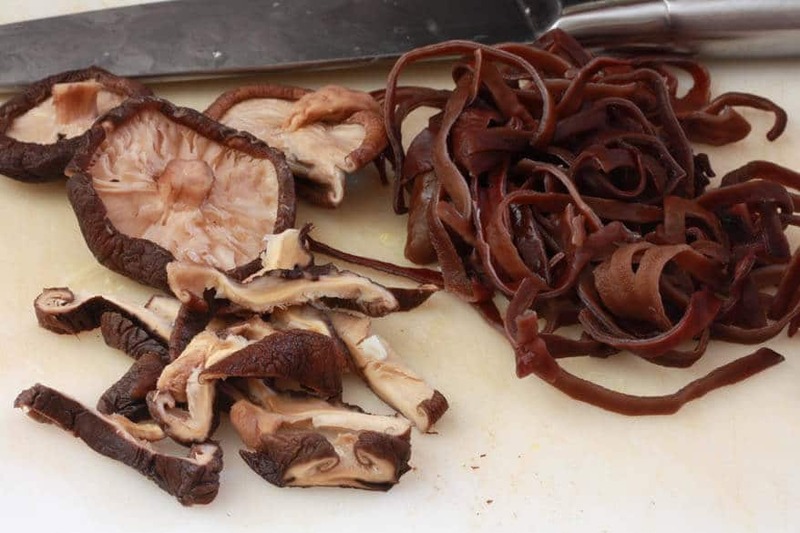 Wood ear mushrooms can be found in Asian stores – called Black Fungus there and imported from China. And then of course there are the ones available from FungusAmongUs which are harvested here. YUM! One of my favorite soups. Can’t wait to try making it at home! Thanks. I am so fascinated with Asian cookery! When sourcing something new to cook..I usually go for Asian or Latin because I love the hunt for exotic ingredients. I recently visited an Asian grocery store and was in heaven!!! Its very true what you say…the caliber of a good Chinese restaurant is in the soup! And hot and sour happens to be my fave! Do you mind sharing the brand or type of hot sauce you are using? Hi Jenna! You know, I don’t know what brand it was! I just used up the last of what was left of some generic brand I had in the fridge. You may not need any at all depending on your heat level preference. The chili oil is also hot. Well, I would definitely like use them in this soup now! Because this is my most fav restaurant soup ever! and I’d love to make it as soon as they arrive in the mail! I love Hot and Sour soup it, is my favorite and I have not found a good homemade one until now, made it and loved it. Thank you. Wow, you wasted no time, Sharla! Thanks for making it and for your feedback – so glad you enjoyed it! 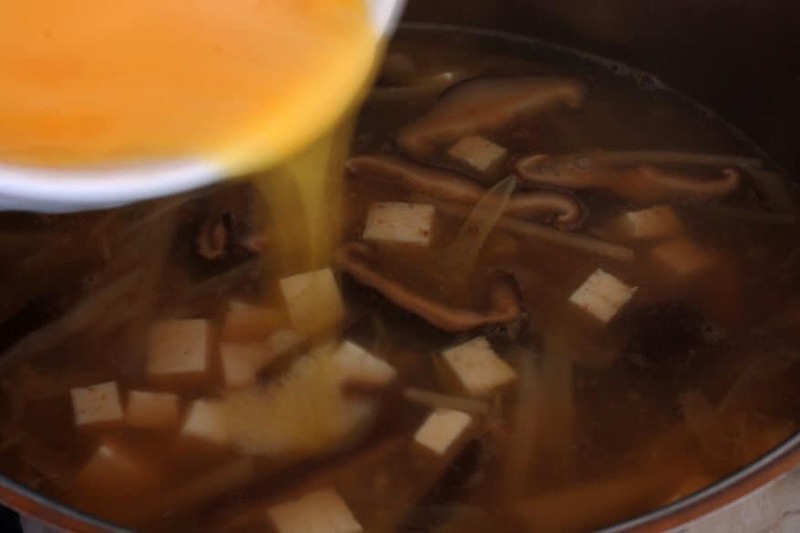 This looks like my new go to hot and sour soup recipe … if only i could win the mushrooms! Thank you for a great post. Thanks for the compliment! I hope you’ll give it a try and let me know what you think! Made your recipe last night….exceptional, thank you! Did I miss when to add the sugar? Hi Carl! Fantastic! I’m so happy you made and enjoyed it! No, I missed when to add the sugar! Thanks for noticing that – I’ve just added it to the instructions portion of the recipe. Thanks so very much for your feedback! Where do you get black vinegar and chili oil? Want to make a triple batch of this! Hi Roger! 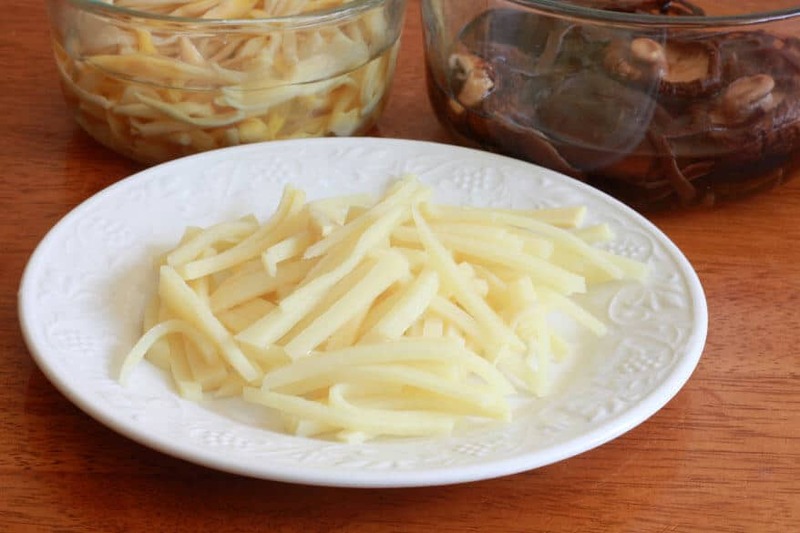 Both of these ingredients are staples in Chinese cooking and you can readily find them both at any Asian store. If you don’t have one in your area, they’re also easily found online. So happy you’re making this! Let me know what you think once you’ve had the chance to try it! What a fantastic recipe. I made this today and it is spectacular. 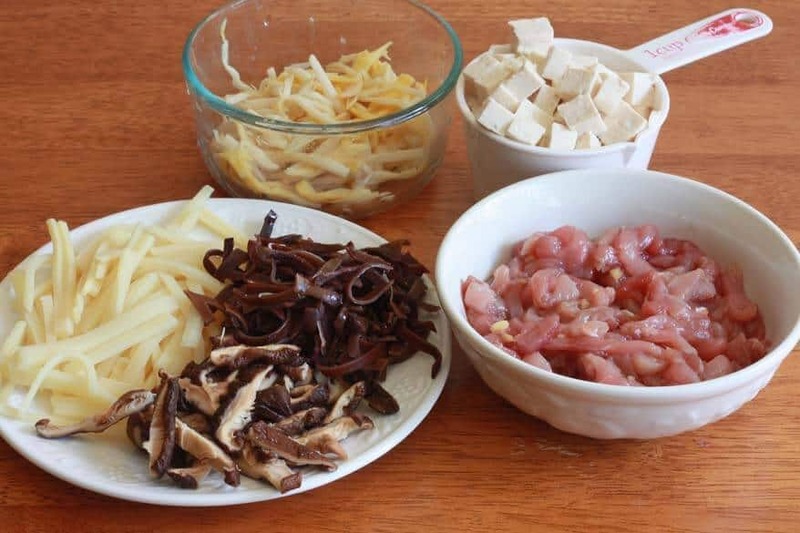 I have the ingredients because I order take out and add the good stuff when the Chinese restaurant leaves them out or adds only a little to save money. I add baby bok choy sometimes to this and I like it. 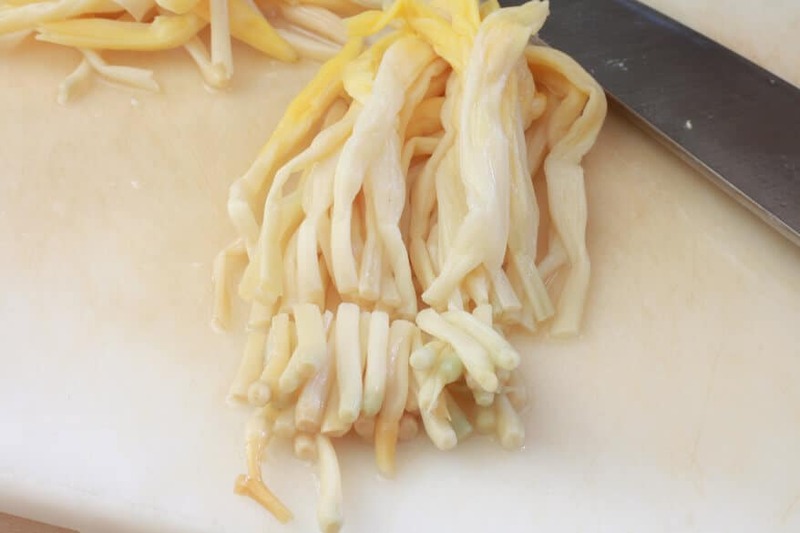 I like the matchstick bamboo shoots and add water chestnuts for texture. I’m so happy to hear that you liked it! That’s great that you keep those ingredients on hand to embellish and authenticate the restaurant versions :) And since you end up having to go through the effort of doing that, you might as well just make it completely from scratch, right? Thanks again for making this and for your feedback! I’m going to try this delicious sounding and looking recipe. I love the way you display the directions with photographs.! Hi Naomi! Yes, some of these ingredients would definitely be challenging to find in a small town. I’m fortunate in that I have access to several Asian stores in my area. I’ll provide some links in the recipe box to where these ingredients can be conveniently purchased online through Amazon for those who cannot purchase them locally. Hope that helps! Hi Kathryn! Yes, I would imagine it’s very challenging. Are you able to find those ingredients online from where you are? This soup truly looks divine! I am going to have to improvise a lot as far as the ingredients are concerned!! Hi Rahul! Yes, depending on where you live some of these ingredients can be very difficult if not impossible to find in local stores. I’ve included links in the recipe where you can purchase these ingredients online, but I realize that may not be an option either. Good luck with your improvisations and let us know how it goes! 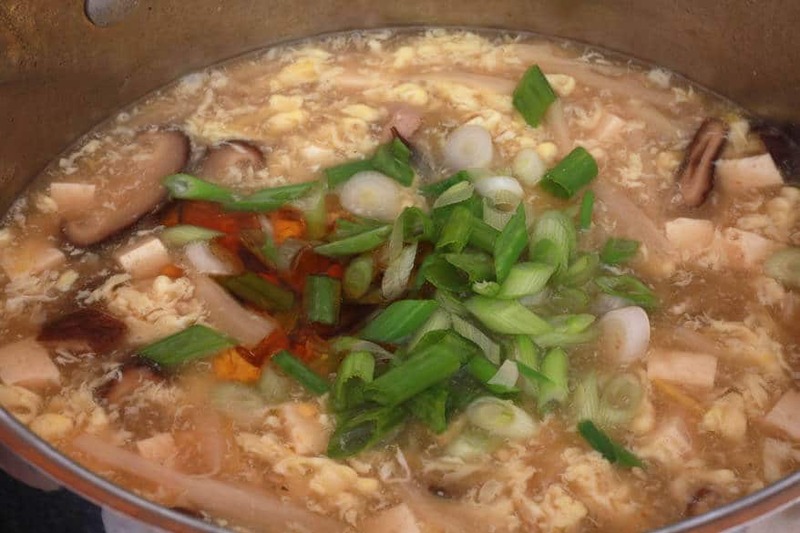 I have researched many hot and sour soup recipes. This is the first I have found that used fresh minced ginger. 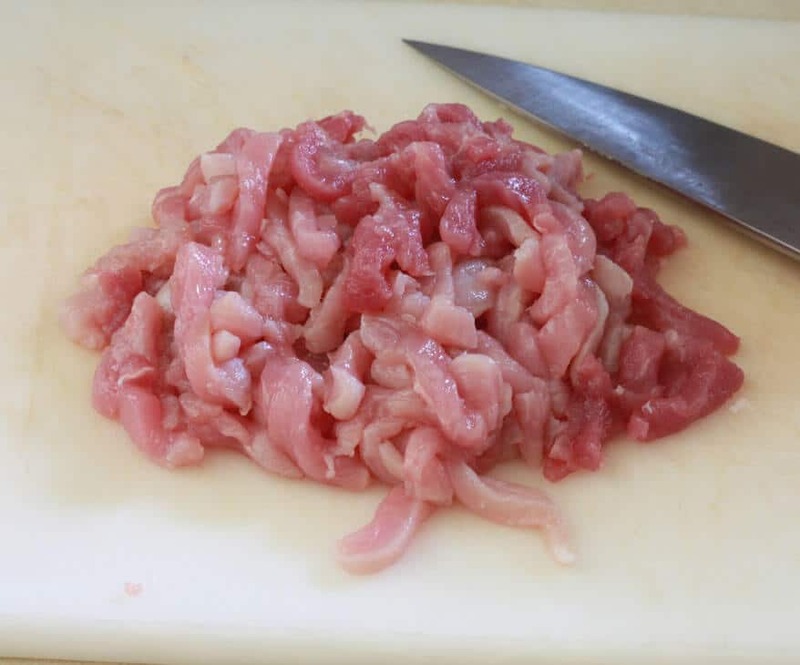 It adds an additional layer of unexpected flavour to the pork. I will have to seek out FUNGUS AMOUNG US. I live in rural Michigan and had to send to Thailand for dried lily flowers. Hi Janet and welcome! 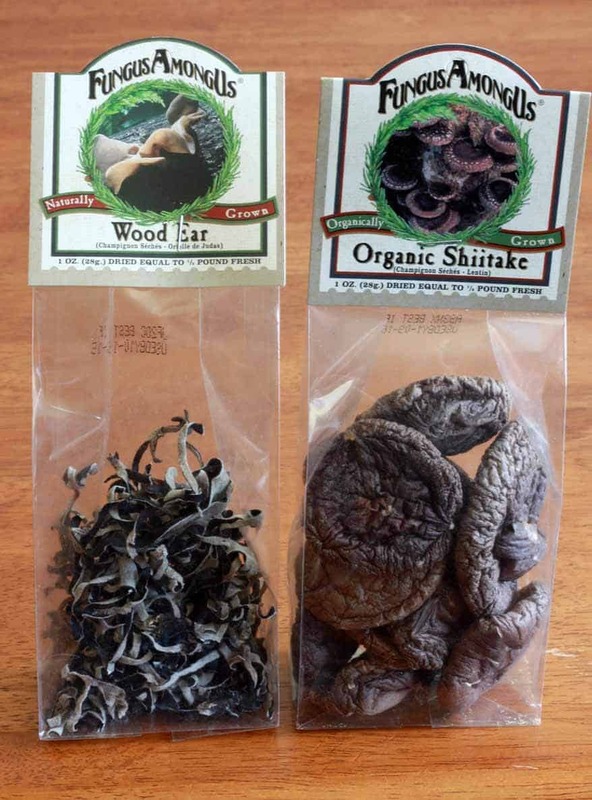 There are several companies that sell dried mushrooms here in the U.S., FungusAmongUs being one of them. 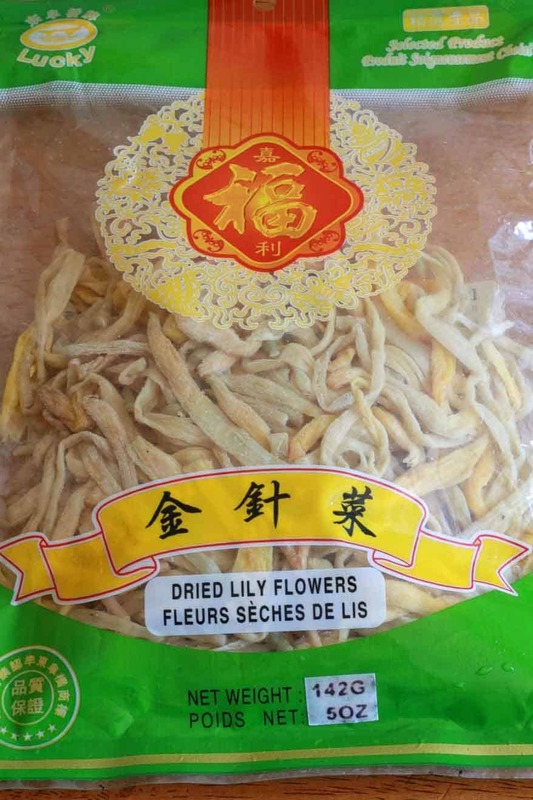 I was fortunate to have found the lilies in a local Asian store, but I know that many areas don’t have access to such stores, so I included some links to where some of these ingredients can be purchased online. Thanks so much for visiting and I hope you’ll return again and again! I used vegetable broth because that’s what I had on hand, and fresh sprouts in place of the lily.some rooster sauce, and a fresh tomato, wedged and and added towards the end. You are very welcome! I’m happy you found my recipe and hope you enjoy it! I’m going to try this tomorrow making stock using my Thanksgiving turkey carcass. I don’t have the day lillies but can’t wait for them to arrive! I don’t have wood ear or shiitakes but have oyster and lots of morels (I’m in MT so have lots of dried morels I pick). I figure it’s worth a shot. It sounds so good, I just can’t wait. I’m adding some rice noodles to make it a meal. I’d like something to serve with it but nothing comes to mind- any ideas? Hi Charity! That’s great that you’re going to make this! And I’m envious that you have so many morels. Washington State, where I live, is known for its morel harvests too, but I haven’t harvested any yet. My husband and I went mushroom foraging a few months ago and found some gorgeous chanterelles. This Spring we’re definitely going to try and find some morels. What to serve with the soup…if you don’t care about keeping the Chinese theme consistent, I would just go with some rolls and a salad. If you want to stick to the Chinese theme, egg rolls would be a great accompaniment (homemade tastes best, of course, but to save time there are some good store-bought/frozen ones). You can just pop those in the oven and have them ready with the soup. It also depends on whether you’re having the soup as more of a main dish or as a side dish/appetizer. If it’s the main dish, then something the egg rolls, a small side serving of fried rice or stir-fried noodles would be great. If you have it in mind more as a starter, then any of the Chinese main dishes on here would be great (scroll down the page on my blog a little ways and on the right sidebar you’ll see a “categories” dropdown box. You can select “China” to bring up all the Chinese recipes. They’re all fantastic and relatively quick (the Orange Chicken takes a bit longer). But the Shanghai Noodles, just for example, are super quick and very good. And now I’m just starting to ramble… :) Whatever you decide to do, I’m sure it’ll be fantastic and whoever you’re enjoying the meal with is lucky to have someone who’s willing to be adventurous in the kitchen! me again- is there a specific sub for black vinegar? I’m guessing rice vinegar but don’t want to mess up the soup. Thanks for the compliment, Charity :) The closest substitute for black vinegar would be balsamic vinegar. Just do a direct substitution – same quantity. hi, what kind of tofu did you use? firm? Hi Hannah! 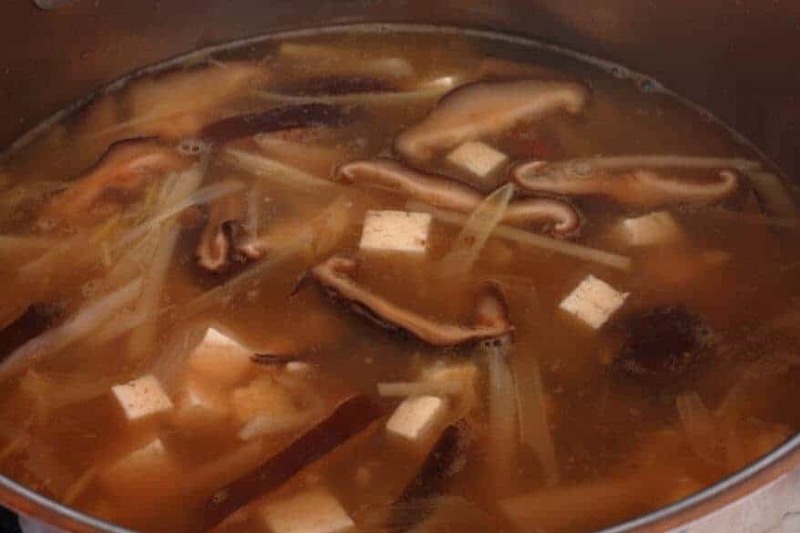 Typically firm tofu is used but it really comes down to personal preference – whether you prefer a firm tofu in a soup or rather a soft one that dissolves more easily in your mouth with each bite of soup. I love trying new products as well as foods that are not commonly used. This is the most interesting h/s soup recipe I’ve seen and would like to try it for my family. Nothing is more pleasing than seeing the smiles on their faces when they taste a delicious new recipe for the first time. I am an amateur cook and your instructions make it so easy that I can’t wait to go ot to the Asian grocery store to pck up the necessary supplies for Hot and Sour soup. Thank you. You’re welcome, Norm, I’m excited you’ll be making this! Happy cooking and enjoy! Hot n Sour soup is the best thing a person can eat when feeling a bit under the weather and I have it at least 3 times a week just because I love it so much! I`m familiar with most mushrooms including the delicious local “sponge” mushroom we have here in the Midwest. I can`t wait to try this recipe! It sure is, Bob! I’ve always been fascinated by all the different kinds of edible mushrooms. I’m not familiar with the Midwest sponge mushroom but there are a number of mushrooms that can be substituted in this soup. Your local mushroom may elevate this soup to new heights! Happy cooking, Bob! Phil from Liverpool UK here. Tried your recipe this evening and have to say very impressed. Our restaurants here in England include prawns (that’s shrimp to you :-) ) and the soup is served with a distinct reddish colour so i added some prawns and added a few drops of red food colouring into the stock which worked well. Gutted when i realised half way thorugh i ran out of eggs, but still the end product was really really good. Kudos to you..recipe is great and for sure will be making another batch real soon!!! Hi Kimberly, will veal or chicken work fine with this recipe? Hi Jennifer, absolutely! You can also leave the meat out entirely. it’s me again :) …… if i use veal, then should i use beef broth OR stick to the chicken broth. I would like to win these mushrooms because the restaurant that we frequent at least 3 times per week has the BEST hot and sour soup I have ever eaten bar none. I would like to make your soup and see if it really is as good as the best I have had in a restaurant. 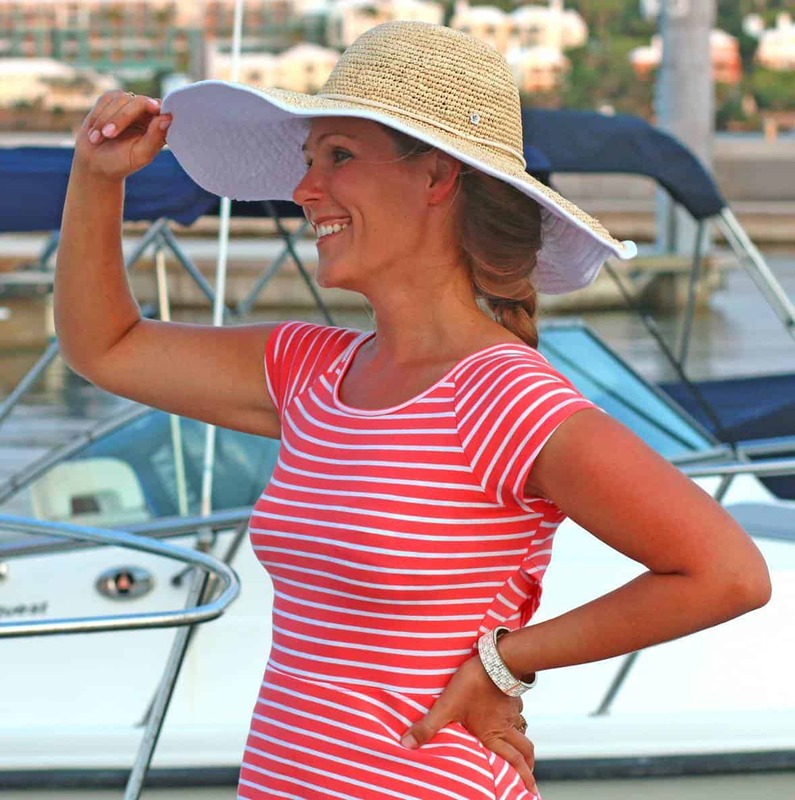 Hi Mary, definitely give this a try and let us know what you think! Hi, Can’t wait to make this recipe this weekend for a friend! However, I’m leaving out the pork (since my friend abstains from meat). 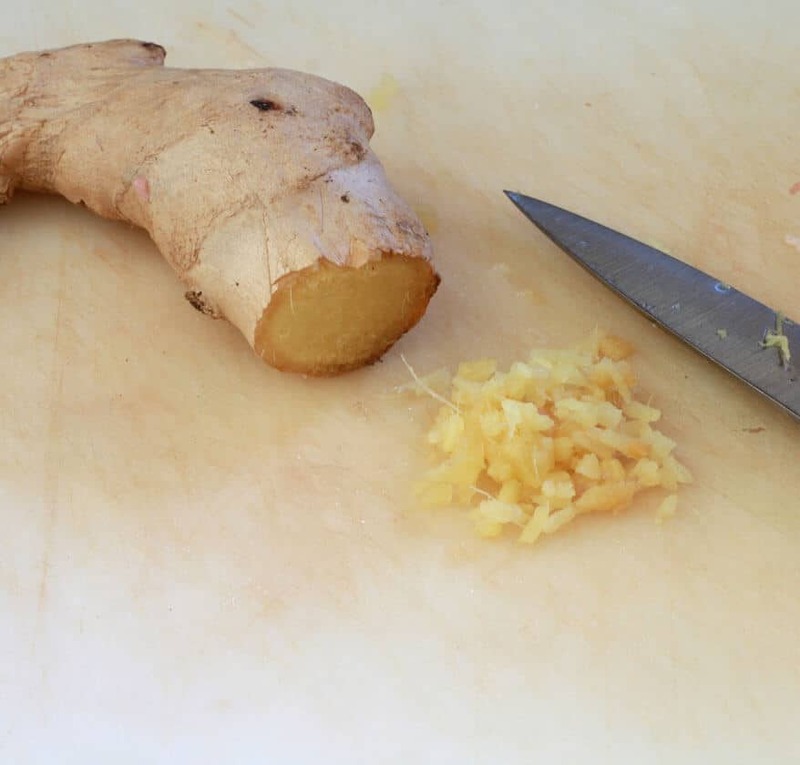 Shall I just mix the ginger and soy sauce together and set aside…does it matter? Hi Erika! Correct. No adjustments are needed. 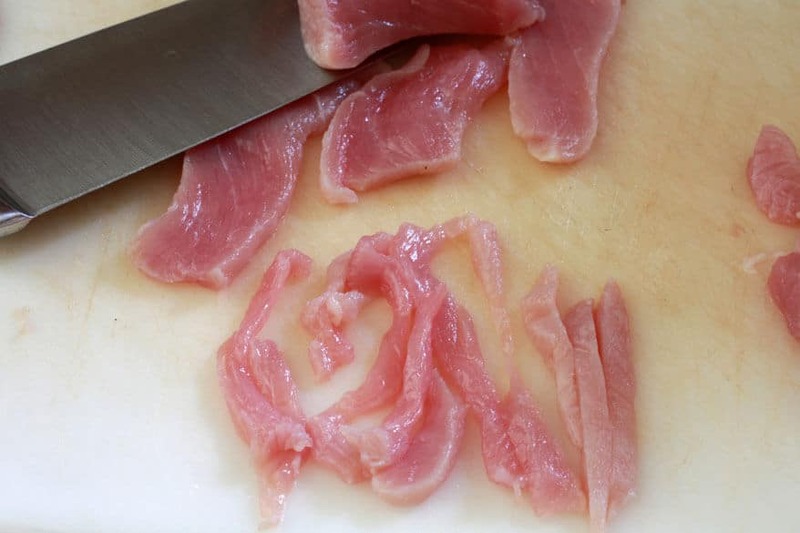 Simply omit and pork and follow the recipe as outlined. Happy cooking! So I went immediately to daring gourmet.com. I made this just today. It (as always) all the recipes I tried from this site was awesome. 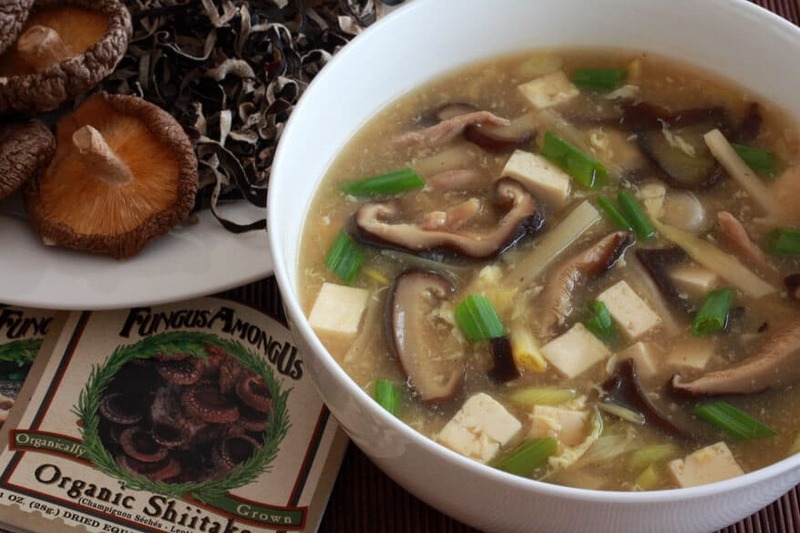 I’d like to try the mushrooms because I want to make this Hot and Sour soup. I’m making this recipe because I like the soup and I have the ingredients except for the day lilies. I think this recipe will be a great tasting soup. This is a great recipe with bold and pungent flavors. A couple of observations worth noting. This soup is plenty spicy without adding the optional hot sauce. Even though I like spicy foods I did not add it and was still sweating an hour after eating. Also, the multi-dimensional textures in this recipe were amazing. I like the soup I get from the Chinese restaurant I frequent, but it probably sits on the stove all day and ends up taking on a monotone soft texture. Now I know what fresh hot and sour soup is supposed to taste like. Well done Kimberly! Hi Cary, I’m so happy you enjoyed this and really appreciate the detailed feedback, thank you! I don’t personally add hot sauce to mine either, but I don’t have as high of a heat tolerance as some do, so the option is there to add additional heat for anyone who likes it really spicy. Thanks again, Cary! Hands down THE best hot sour soup I’ve had. And I’ve tried many different recipes on the web. It’s as good or better than the soup served at my favorite SF restaurant and that’s saying a lot. Well done and thank you! I am so thrilled to hear that, Nathan, thank you! Such fabulous flavors! Perfect for this cold, snowy day!!! Thanks for the step-by-step photos. I’m familiar w/ the mushrooms but hadn’t even heard of the day lilies. Consider me intrigued! awesome that you recreated this soup at home! I never realized how involved making a delicious version was! My husband has a favorite Chinese place that we go to and this is one of my all time favorite soups there! I can’t wait to make this at home! This soup looks fabulous! Now I have to go to my favorite Asian market and stock up on some ingredients to put it together!! 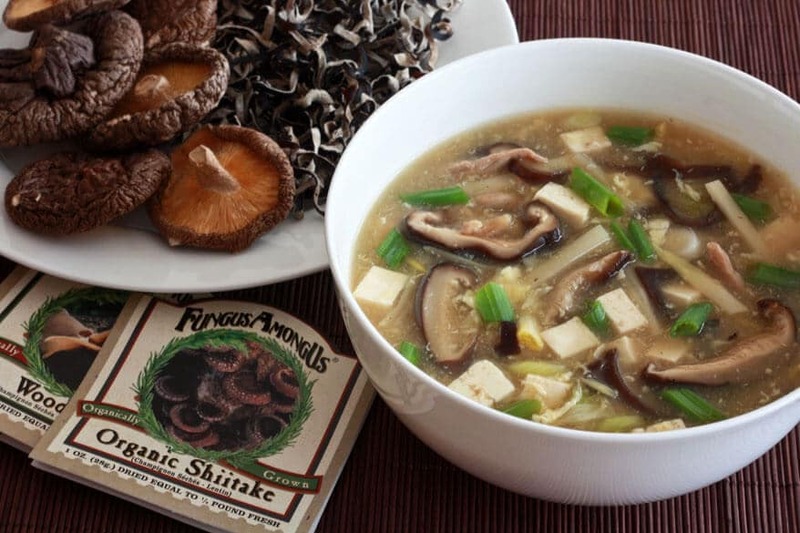 I adore mushrooms and this soup looks amazing! Absolutely fantastic soup! This has always been my favorite soup to order in Chinese restaurants. I’ve tried several recipes and none of them have come even close to my favorite restaurant version. I have to tell you, yours is even BETTER than my favorite restaurant version and that’s saying a lot. Well done. Will be making this again and again. Cheers. Awesome, Nathan, I’m so thrilled to hear that, thank you!